My girl used to sing all the time. I remember when I enrolled her in the ART Station summer camp in Stone Mountain. She was part of the chorus for a play about Greek mythology. Oddly, and to the huge delight of the audience, the script called for them to sing “Holding Out for a Hero” by Bonnie Tyler. My girl was up front, and she belted out the lyrics like they were fire from a dragon’s heart. I will never forget it. She didn’t sound like Christina Aguilera, but she sounded like herself, and she could be heard over all the others. I loved that. Wouldn’t you love that? Parents usually sit in wait for what will be revealed as their kid’s passion. Most hope for a surgeon, a financial wizard, or a savant of some kind. 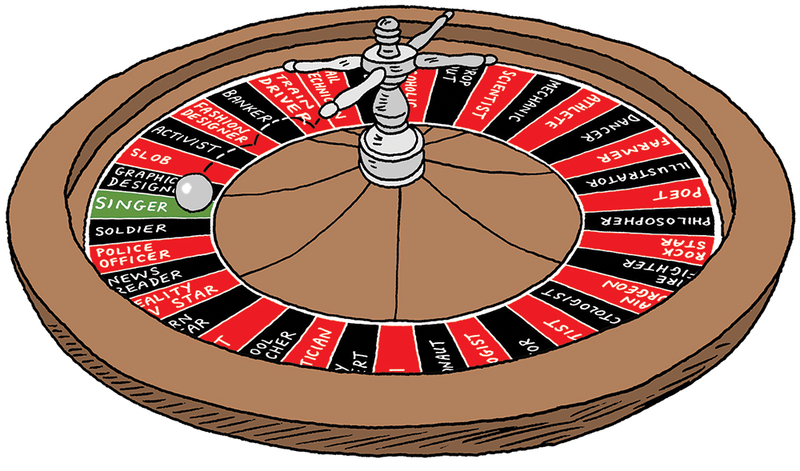 The roulette wheel spins, and the ball drops. I got music. And I say “I got music” because it’s just like when your child is born and people ask you, “What did you get?,” and you say “I got a boy” or “I got a girl.” And then later, you keep discovering what you got. It’s like, “Wow, I got a boy who loves karate,” or “Awesome, I got a girl who is passionate about civil rights”—or mathematics, opera, equestrian competitions, Internet algorithms, or whatever. Whatever you get, it’s always a surprise. It’s like that booth at the fair where you put your money in to pull a string for a chance to win an iPad, a finger puppet, or anything in between. There are variables that are up to your control, but barely. It’s mostly luck. So when you pull the string and you get music—wow, your girl is into music; she loves to play the guitar, write songs, and sing—you walk away feeling like a winner. Because the string could have pulled up bank robber, Ponzi schemer, hammer-claw killer, or something like that, right? Don’t complain. Walk away a winner. Thank you, is all I have to say to the cosmic carnival worker who supplies the strings. Thank you. But then my girl stopped singing. I mean it was all of a sudden. She told me someone said she wasn’t a good singer, so no more of that. “Please just sing ‘Blackbird’ by the Beatles again,” I implored, “or ‘Heartbreaker’ by Led Zeppelin.” But no, it had been determined by outside forces that singing was out. After that, I kept waking up with a song in my head. Most would consider this a good sign, but I’m ambiguous. These were bad songs—like Peaches & Herb bad. Reunited, and it feels so good . . .
Or Katy Perry and that song about hearing her roar. One time it was “Moves Like Jagger” by Maroon 5. Mae was four when she met Adam Levine. Maroon 5 was the musical guest the same night as my appearance on The Tonight Show. She and her friend Madelaine were literally under the feet of the band members as they sat in the studio’s vintage barber chairs during makeup. Levine’s mother was there, and she helped wrangle the girls when it was time to go to the green room. But I am sounding desperate. She can smell it on me like an animal in the wild. And isn’t that what being a parent boils down to? You are a ferocious animal protecting your prodigy. You’ve been given a prize by the cosmic carnival worker—you pulled the string—and someone is trying to diminish your prize. But no, I’m not going to let you. I get it now. Why I wake up with those song lyrics in my head, like “You’re gonna hear me roar.” Because roaring is not always ferocious. Sometimes it is just waking up in the morning with the conviction that you are not giving up. Sometimes it means sitting with your girl and playing Sting, Bob Dylan, No Doubt, Maroon 5, the Rolling Stones, the Eagles, and any number of other bands fronted by singers who sound nothing like Christina Aguilera. Over and over and over, until one morning you hear your kid singing again behind the closed door of her room, tentatively at first, but then belting it out like fire from a dragon’s heart. I’m so relieved. You might not think this is serious. But seriously—so seriously—what is worse? A dream that doesn’t come true or never admitting you dream at all?